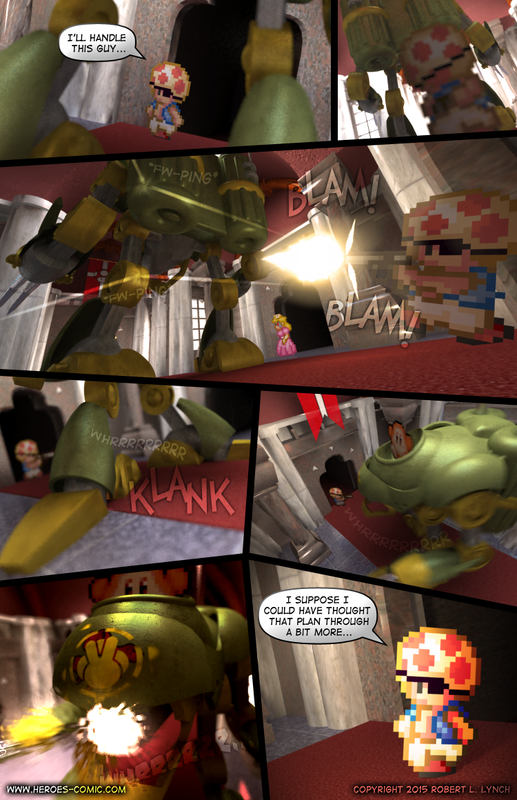 0526 - Battle for Mushroom Castle Part 13 - Heroes Inc.Heroes Inc.
Ok, sorry again for the lack of comics. I have a toddler, so I’ve been a bit preoccupied. I am however working on sorting out a few aspects of my life, including time management, so I hope to get back to regular updates more or less soonish. Note: I made some tweaks in the post comment code because I was getting literally thousands of spam messages, so from now on, posts over 14 days old are closed for comments. Also, I don’t know if it’s an issue with the theme code in relation to wordpress updates or something, but the comments don’t seem to be tallying up correctly anymore. As of this post, there are 4 comments on page 525, but the heading is reading like there aren’t any, despite still showing the comments themselves. I don’t know what is up with this, but I’m not really in a hurry to fix it. Feel free to continue commenting as usual; I’ll read them regardless. EDIT: Fixed. Turns out one of the anti-spam plugins I have used for years which hasn’t been updated in years was incompatible with the more recent version of WordPress. Everything should work fine now. This entry was posted in Action and tagged Magitek, Robo-Peach, Toad. Bookmark the permalink. NoooooooooooooOOoOoOoOoOoOOOOOOOOooooOOOO!!! *Sniff* please not eye-patch toad, he’s cool. Also wow. First and 2nd on a new comic. I feel so honored. I’m not tooting my own horn I honestly think this is a rare thing to happen to me. Maybe 1 or 2 other times in my entire 28 years of living and X number of years since “FIRST!! !” was a thing. It’s not rare when nobody else comments. Great to get back to the story. Take your time, Rob.